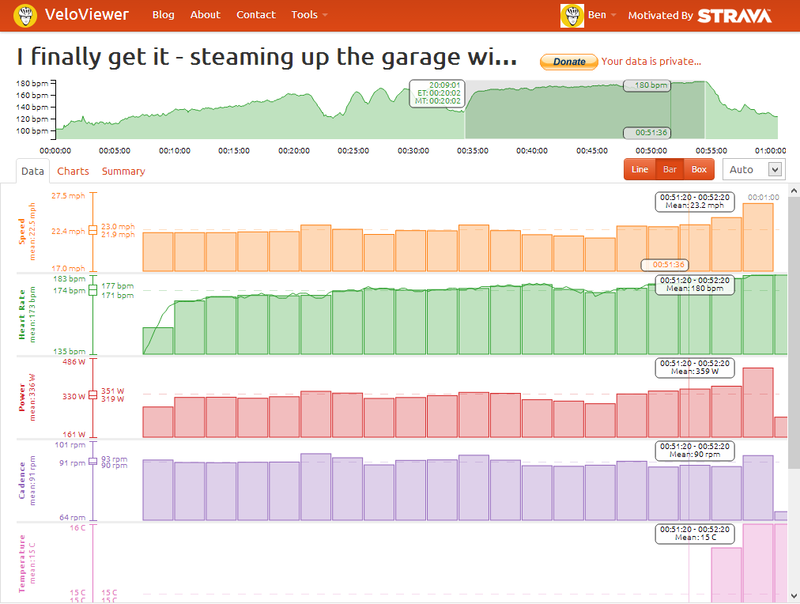 Most of you by now will have tried out the new activity details page on VeloViewer but in the depths of a northern hemisphere winter, here’s how you can use it to find your Functional Threshold Performance (FTP) in conjunction with The Sufferfest’s Rubber Glove video from the comfort of your own kitchen/garage/cellar/gym. The FTP is basically the maximum performance you can sustain over an hour and so is a great benchmark for how well you’re going. This is best calculated using power but for those of us without such an extensive pay check then you can also work out your FTP using your heart rate. Thankfully you don’t have to subject yourself to a full hour of suffering as 95% of your max 20 minute effort can also be used. Power based FTP’s can be compared but heart rate based FTPs will be in a much lower range and only make sense to be compared against your own previous, heart rate based FTPs. If you’re a Strava Premium user then head over to the Rubber Glove video on Strava and get busy. Otherwise its off to Rubber Glove video on The Sufferfest site to break out your credit card. Make sure you at least have your heart rate being recorded but use a power meter if you’ve got one, then go exploring your pain cave. Don’t worry about trying to make notes as you go along, we’ll sort all that out from the comfort of your armchair later. If you were able to take in the instructions while you were doing the session then you obviously weren’t suffering enough so go back to step 2 and try again! For the rest of you, open up your activity in the VeloViewer Activity Details page and you should see something like the above image. The heart rate is shown as the main visual at the top of the page with time on the horizontal axis. Now the whole Rubber Glove should come flooding back to you with the warm up, short sprints and the 20 minute effort being all too obvious. Select the 20 minutes of your main effort, fine tuning it as required to get the best fitting 20 minutes. Note that the amount of time for the selection is shown in the popup to the left of the selection in the top chart. If you’ve used a power meter then take the mean value (shown in the vertical text next to the Power heading) and multiplier it by 0.95. The power shown in my activity above is Strava’s calculated power so will most likely be way off as it is based on speed which is a rather untrustworthy metric on a turbo, but if it had been from a power meter then my power based FTP would be 336 * 0.95 = 319 watts (which comes in at 4.1 watts/Kg). If, like me, you’re just using heart rate then do the same thing using the mean heart rate and once again, multiply that value by 0.95 i.e. 173 * 0.95 = 164 bpm. Choosing the bar option will give you your minute by minute averages (as shown above) which can show a bit clearer where you slacked off, as I appear to have done from 14 to 17 minutes. Get training, and then after a number of weeks perform the Rubber Glove again to (hopefully) see how much you’ve improved. Note: I reckon that if you’ve never done the Rubber Glove (or an equivalent FTP session) then you might actually need to do it a second time to get a proper figure. I’m convinced I didn’t make myself suffer enough on this first attempt so will try again this week and see if I can get a higher benchmark. Would it be too server intensive to calculate the best 20 minute window and have a button to select that window? It wouldn’t be server intensive at all because any script would run on the client, but it would be a tricky thing to write and it would be remarkably specific to Rubber Glove. Only takes a couple of seconds to select it manually. If you wanted to build such a feature server side you might find the source code to Golden Cheetah to be helpful in this regard. They have routines to find your best intervals over a given duration. It is really handy. I agree about not disregarding power if a trainer is used. I use a CompuTrainer and the power values are reliable. I’m supposing there isn’t something in the Strava API that denotes if the power is estimated or taken from a device, but that would be ideal. Thanks, that’s really great. It’s clear for a power meter. But if you measure the FTP via heart rate e.g. 164bpm. what is going to change if you improve your fitness level? PS: the comments here in the blog are cropped when I enlarge the font multiple times in the browser. Cool. Good question, I’ve no idea to be honest and if anything writing this post and reading the comments (on here and on my Facebook page) has got me questioning the usefulness of the heart rate based FTP. Possibly the Strava calculated power could be of more use to those of us without power meters as long as the trainer is set up the same each time you run a test. I think I’ll make a few changes to the post tonight as that would suggest that the speed on calculated power could be used (all other things being equal). p.s. My cop out answer to the comment cropping is to take it up with Disqus as it isn’t my code:-) Using browser zoom in Chrome seems to work ok.. The bit from Sufferfest sound’s reasonable. Thanks. It’s still useful to know one’s heartrate FTP to train in specific FTP-related zones. I hope the prices for powermeters are going down soon!